Fearing fresh protests from Palestinians, Israeli forces have moved to close the West Bank for 48 hours, preventing Palestinians from entering. The protests have been sparked by a recent decision to include the Al-Aqsa mosque as an Israeli heritage site, as well as a plan by Israel to add up to 1,600 settlement homes in the West Bank. The Al-Aqsa mosque is a holy site for both Muslims and Jews, however Muslims fear that along with the rest of Jerusalem, Al-Aqsa is to be annexed and claimed by Israel. It has been a flash point for conflict during the Israeli-Palestinian conflict, sparking the Second Intifada in 2000. Only worshipers with an Israeli identity card and age 50 or over were allowed to pray today at the mosque. In response, Palestinian youths have reportedly thrown rocks at Israeli soldiers, and several Palestinians have been badly wounded. Some 3,000 Israeli soldiers and policemen are patrolling Palestinian East Jerusalem, checking ID cards and positioning themselves on rooftops. 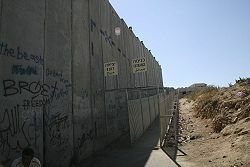 The legal status of West Bank by the United Nations Security Council, the United Nations General Assembly, the International Court of Justice, and the International Committee of the Red Cross refer to it as occupied by Israel.